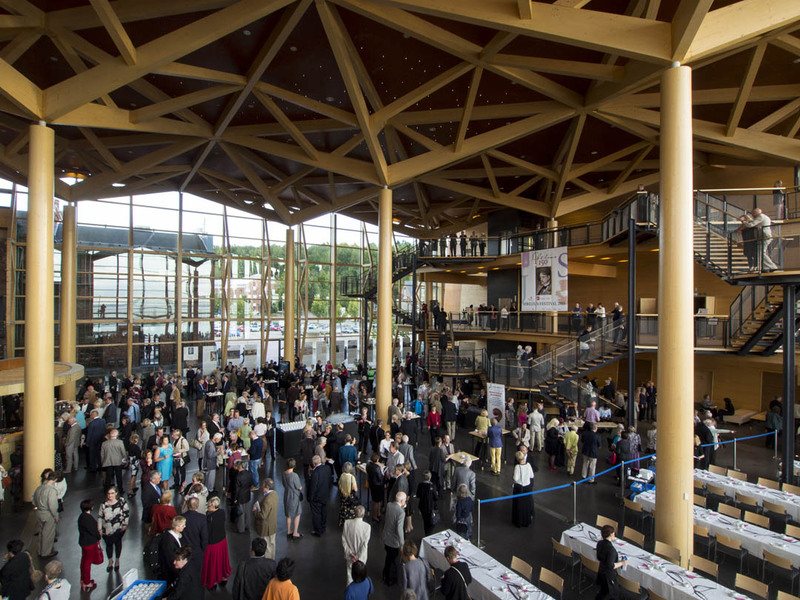 I had the great pleasure of attending this year’s Sibelius Festival in Lahti, Finland, about an hour northwest of Helsinki. From August 31 to September 5 I heard all seven of the symphonies plus the early Kullervo Symphony, the Violin Concerto, and a number of shorter works. Chamber, solo, and vocal works were also played, but I only caught a nice performance of the composer’s wonderful “Voces Intimae” Quartet by the Tempera Quartet, an 18-year-old foursome of Finnish women. My review appears on the Musical America website in two parts, on 9/17 and 18. Sibelius Hall’s woodsy lobby. Photo: Juha Tanhua. I discovered two conductors I had never heard in concert, Okko Kamu and Leif Segerstam. I only have one of Kamu’s recordings—a Sibelius Third Symphony on DG that he recorded in 1969 when he won the Karajan International Conducting Competition. Karajan didn’t like the Third, and when DG couldn’t talk him into recording it to complete the cycle, the label gave it to Kamu. I think he also recorded the Second for DG (I’ll have to look for that) because Karajan eventually did the First and Second for EMI. Kamu’s bio says that he has recorded over 100 CDs; I have a lot of catching up to do! I have none of Segerstam’s, even though he made a cycle of Sibelius symphonies for Chandos. The Gramophone reviews found them eccentric, so I didn’t bother with them, but I think I’ll try to find them now that I enjoyed his concert so much. I doubt if I’ll ever get to hear him live again, however. He’s rather portly, and he shambled on- and offstage precariously; he sat to conduct, but his broad tempos certainly never lacked energy. When I googled him, I was astonished to find that he is only 72. This will be Kamu’s last season, after five years, as principal conductor of the Lahti Symphony. I was quite bowled over by his knowing way with Sibelius—warm, expressive, unaffected, relaxed but never slack or soft-edged, and with a natural give and take between sections. How rare all these qualities are in one package. Furthermore, so many conductors and, in the Violin Concerto, soloists play Sibelius’s music lugubriously these days. I told him backstage how much I liked his tempos, and he chuckled, saying, “I was told they were too slow.” BIS has just released a set of the seven symphonies with Kamu, which I look forward to hearing. Curtain call for the Lahti Symphony and Principal Conductor Okko Kamu. Photo: Juha Tanhua. Like all great music, Sibelius’s is open to many interpretive approaches, and they were in evidence in Lahti. Most I liked, some I didn’t, and that’s okay. Since his centennial in 1965, they have been increasingly preserved on recordings. Leonard Bernstein’s unabashedly Romantic cycle (Sony) dominated our Stateside view of the symphonies, whereas in Europe the grandeur of Sibelius’s Germanic influence was personified by Herbert von Karajan (DG and EMI). In the 1970s, the more austere visions of Colin Davis (Philips) and Paavo Berglund (EMI) held sway. Today’s reigning Sibelian is undoubtedly Finnish firebrand Osmo Vänskä, whose Lahti recordings on BIS’s complete works of the composer have won wide critical approval. To no surprise, his festival concert was excellent. Last season he proved his commitment to his fellow Finn’s music when he resigned his Minnesota Orchestra music director post after a labor dispute resulted in the cancellation of his complete Sibelius symphony cycle at Carnegie Hall. 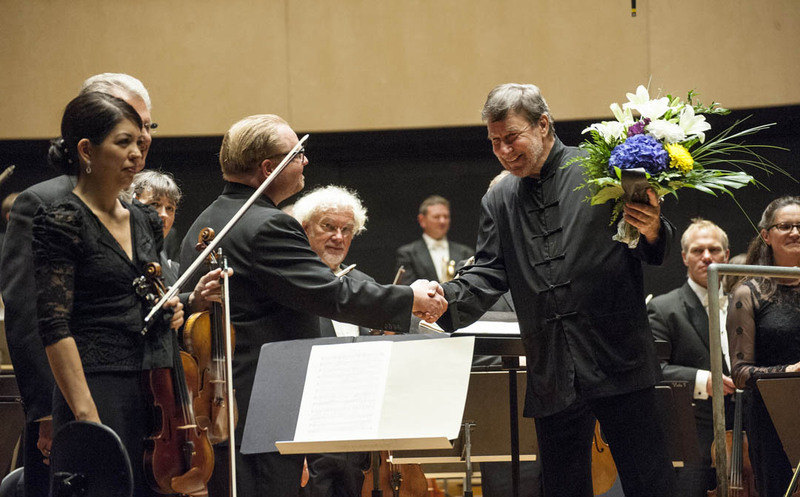 The upshot: Sibelius and Vänskä triumphed. The musicians implored their conductor to return, and top administrators and board members quit. Carnegie could only schedule the first of the two Minnesota concerts in its upcoming season, and Vänskä told me he had heard that it was nearly sold out. The second is sure to follow. I expected this to be a short blog of postscripts to my Musicalamerica.com review, but it’s gotten out of hand. 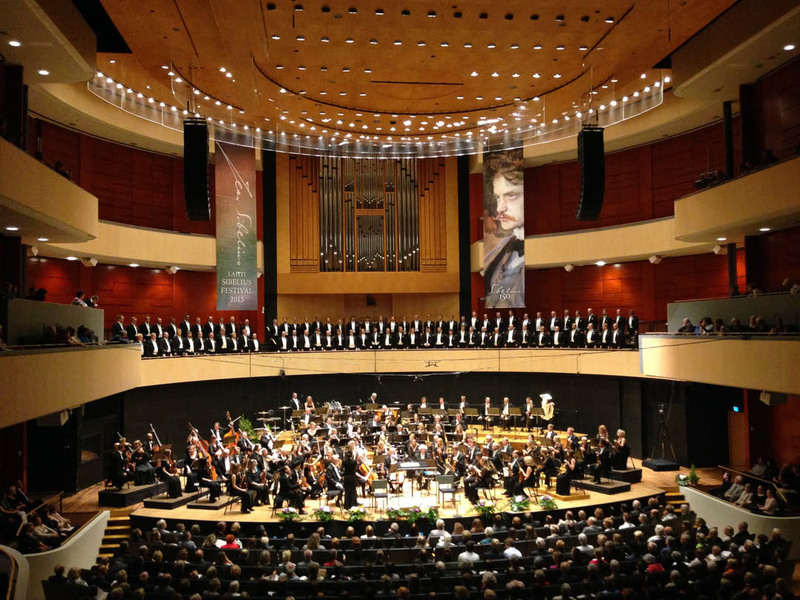 Still, I must comment further on Lahti’s extraordinary Sibelius Hall. What a beautiful, sonically natural acoustic. Instruments are fanned out on risers, yielding distinct separation of the five string choirs, unique woodwind timbres, and gleaming but never glaring brass. The drums are effortlessly audible from the slightest tap to the most dramatic thwack. Tuning up in Sibelius Hall. Photo: Larry King. What about those patented Artec acoustical “doors,” which theoretically provide greater resonance when open. Jukka-Pekka Saraste wanted them open for his concert, and they were also open for Kamu’s final concert in the hall. Acoustician Russell Johnson is no longer around for friendly disputation, but Chris and Larry King, another former Artec acoustician and a longtime buddy, were. I definitely prefer the superior instrumental focus and smoother decay when the doors are closed. I could close my eyes and know where every instrument was. To hear the French horns, positioned on the back left (audience perspective) of the stage, ricochet around the right side of the auditorium was most disconcerting. I can’t believe that Johnson would have approved. The day after I returned to New York, I got a call from Musical America contributor Mark Swed, who had just reviewed concerts at the Lucerne Festival in the Los Angeles Times. A woman had walked up to him at a Santa Monica farmer’s market and declared, “You should have been at Lahti’s Sibelius Festival.” Word gets around. This entry was posted on Thursday, September 17th, 2015 at 7:43 pm	and is filed under Why I Left Muncie. You can follow any responses to this entry through the RSS 2.0 feed. Both comments and pings are currently closed.